From a post on TOD concerning the observation of a Peak Caviar effect, Luis de Sousa commented on another geographically constrained rise/collapse. The following figure came from a fairly well-known study called "THE INTRODUCTION, INCREASE, AND CRASH OF REINDEER ON ST. MATTHEW ISLAND"
This illustrates a classic example of non-dispersive growth hitting a hard physical limit. The absence of any variation caused by the extremely localized population on the isolated island essentially removed any rounding on the peak. I spent some time looking for such a figure when I posted the "Finding Needles in a Haystack" analysis on TOD last year. Note the similarity between a hypothetical non-dispersive oil discovery model in the following figure and the reindeer growth. Like micro-organisms in a Petri dish, the reindeer basically scoured (i.e. searched) the island for food and then died off quickly. Remember why we do not see this for discovery of oil -- both the locations for oil and the effective search rates over a world-wide geographical area have such a large dispersion that we do not hit that sharp peak, and subsequent collapse. So instead we see the broadened peak in the figure above. 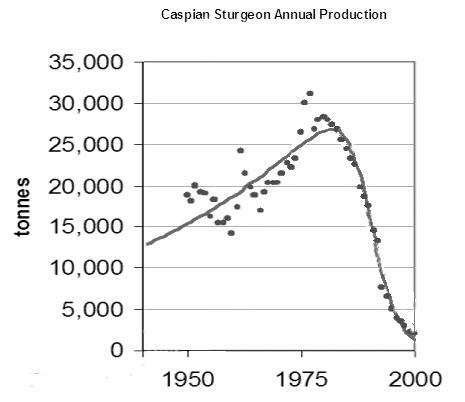 Getting back to the Peak Caviar post by Ugo Bardi, sturgeon from the Caspian area have behaved similarly to the reindeer on St. Mathew Island. Perhaps a little more dispersed, yet still geographically constrained with a focussed harvesting pressure. I would really still like to find a curve or two for a localized Gold Rush discovery profile. It would really surprise me if, say, the take of gold from a place like the Klondike or Deadwood didn't display similar peak behavior. Essentially gold discovery becomes the production model, and any further smoothing of the curve due to shock model extraction phases essentially disappears. That phase smoothing due to construction, maturation, and extraction latencies basically explains why we rarely see the sharp asymmetric curve for oil production, even in the absence of dispersion. In other words, we may see it for discovery of oil in localized regions, but not for the final production. hi there...how do you manage your blog to get PR5?